Montreal Neurotherapy is proud to present to their patients the new After Stroke Motor Rehabilitation treatment, recoveriX. recoveriX is the first rehabilitation system for stroke patients that pairs mental activities with motor functions. The brain receives visual and tactile feedback in real-time, and that is what makes rehabilitation so effective. 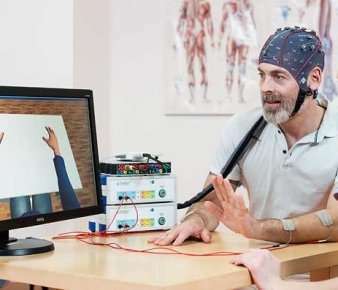 For example, if a stroke patient imagines a hand movement while receiving visual feedback through a virtual avatar, and tactile feedback through electrical muscle stimulation at the same time, then these patients might regain the ability to grasp again, as example. Mrs. Savin suddenly suffered a stroke. It came without warning, and left her right arm completely paralyzed. After participating in recoveriX-therapy, she was soon able to move her right arm again. recoveriX uses state-of-the-art neurotechnology that leads to success even in the case of chronic disorders. A stroke might inhibit your ability to move, but maybe not your ability to imagine movement! Imagine a hand or a foot movement. The imagination triggers nearly the same activity in the brain as a real hand or foot movement – this is what exactly we can use for our therapy! A combination of three feedback-systems improve your chances for successful therapy. The imagined movement leads to electrical stimulation of the affected muscles – without pain! For this stimulation, two electrodes are placed (for example) on the dorsiflexors of the wrist. If the system recognizes a correct motor imagery, the muscles get electrically stimulated, causing a real movement. This should help you re-learn how to initiate movement, and thus make movement possible again. Do not hesitate to Contact Us about this new tool use at the Montreal Neurotherapy Center and see how we can help you regain a good quality of life!